As farmers continue to face increasingly uncertain and often rapidly changing conditions related to markets, climate or the policy environment, people involved in agricultural research, development and extension (RD&E) are also increasingly challenged to consider how their work can contribute to supporting farmer resilience. Research from the social sciences conducted in the last decade has focused on adaptability or adaptive capacity as a key attribute for individuals and groups to possess for managing resilience. It is therefore timely to ask: Do current ways of doing and organising RD&E in the dairy sector in New Zealand and Australia contribute to supporting farm adaptability? This paper reports on results from an examination of case studies of challenges to resilience in the dairy sector in Australia and New Zealand (i.e. dairy farm conversion; climate change adaptation; consent to farm) and the contribution of dairy RD&E in enhancing resilience of farmers, their farms and the broader industry. 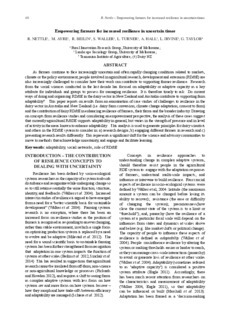 Drawing on concepts from resilience studies and considering an empowerment perspective, the analysis of these cases suggest that currently agricultural R&DE supports adaptability in general, but varies in the strength of presence and in level of activity in the areas known to enhance adaptability. This analysis is used to generate principles for dairy scientists and others in the RD&E system to consider in: a) research designs; b) engaging different farmers in research and c) presenting research results differently. This represents a significant shift for the science and advisory communities to move to methods that acknowledge uncertainty, and engage and facilitate learning.